Is MoCo’s Budget in Trouble? Montgomery County’s $120 million budget shortfall has set off political fireworks this election season, including attacks from Delegate Bill Frick (D-16), who is running for Executive, and Republicans who question how taxes could be going up while revenues are going down. County Council incumbents pooh-pooh it, insisting that the budget decline is unremarkable and the economy is strong. County Executive spokesman Patrick Lacefield, who once predicted that any loss of the county’s $30 million in liquor profits would cause a big property tax hike, now says that the $120 million shortfall is “pretty small” at just 2.2 percent of the county’s budget. What is going on here? Is MoCo’s budget in trouble? First, the incumbents are right to point out that mid-year corrections, including budget savings plans, are not uncommon. Between FY08 and FY11, the County Council approved five mid-year cut packages ranging from $30 million to $70 million each due to the Great Recession. In FY16, the council approved a $54 million savings plan associated with the U.S. Supreme Court’s Wynne decision and disappointing income tax receipts in the prior year. While mid-year cuts happen occasionally, it’s important to note that their history indicates that they are often – but not always – produced by looming economic problems. So what’s causing this one? No one is totally sure yet, but there seems to be two phenomena at work. In Maryland, the state collects income taxes on behalf of local governments and remits them in periodic distributions. 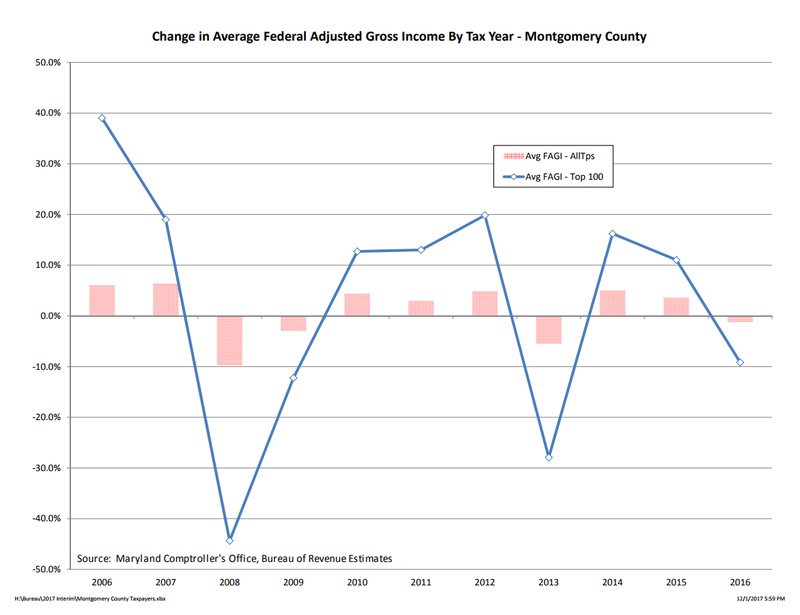 Part of MoCo’s problem originated in its November income tax distribution from the state, which includes extension filers who tend to be disproportionately very wealthy. It’s difficult to forecast income tax payments from wealthy people because their dependence on capital gains and business income can be volatile. The chart below from the state’s Bureau of Revenue Estimates contrasts the annual change in average federal adjusted gross income between all MoCo taxpayers (pink bars) and the top 100 MoCo taxpayers (blue line). Income change for all taxpayers usually varies by single digits each year while income for the super-wealthy almost always varies by double digits. This creates serious forecasting challenges for the county government since the super-wealthy have a material impact on its budget. One relevant fact is that the November distribution may be down by 29% in MoCo but, according to the state, it is also down by 30% in Howard County and 26% in Baltimore County. One thing these three jurisdictions have in common is that they all have substantial concentrations of very wealthy people. That suggests that some of MoCo’s problem is not specific to the county but rather to variations in the incomes of the super rich. To a large degree, that volatility is the result of the year-to-year variations in the capital gains income of a small number of County residents. Illustrating this point, part of the projected FY18 decline in income tax revenue can be traced to a sharp drop in the capital gains of the County’s top 50 taxpayers, who realized gains in tax year 2016 that were 50% of the gains realized in tax year 2015, resulting in $21 million less in County income tax revenue (Revenue Administration Division of the Maryland Comptroller). Staff’s review of tax return data published by the Comptroller indicates that roughly 1.8% of Montgomery County returns report income of $500,000 or greater. On average, these returns explain more than half of any year-to-year increases in income tax revenue, and explain more than 100% of any year-to-year declines in income tax revenue. Another factor could be the tax bills being considered by Congress, which contain numerous large cuts for wealthy individuals and corporations. The super wealthy could be deferring capital gains and business pass-through income to next year when they would be subject to significantly lower rates. If true, that would mean less income tax revenue this year but perhaps more next year when the deferred income is reported. That’s just a theory but it can’t be ruled out. There are other facts that can’t be explained by the tax planning of the super wealthy. First, FY17 (the year of the 9% property tax hike) closed out with $25 million less than expected. Second, the county is writing down $206 million over the next six years in property taxes, energy taxes, transfer taxes, recordation taxes, telephone taxes and hotel taxes in addition to a $212 million income tax writedown. The energy tax revision alone is $100 million over six years. The reason for that is unclear, but it’s worth remembering that since commercial energy users pay roughly double the tax rates of residential users, some assumptions regarding employer energy use may be operative here. It seems unlikely that a “strong economy” would produce such broad, multi-tax writedowns of the kind just put forth by the county. What’s the bottom line? Over the years, we have learned that under most circumstances, economic trends usually matter more than singular events. One good year should not cause irrational exuberance and one bad tax distribution should not cause panic. Whether the recent shortfall turns out to be meaningful or not, MoCo’s serious budgetary challenges are long term in nature. They relate to decade-plus trends of lagging growth in employment and income, repeated funding of ongoing spending with one-time revenue sources and the county’s recent passage of large tax hikes and expensive employment laws at the same time, a unique combination among Washington-area jurisdictions. That is on top of any targeting of Maryland and general economic insanity by Congress. The big question is not about one tax distribution from the state but whether a combination of all these long-term factors will catch up with MoCo in a really bad way in the next couple years. That’s a question for the next Executive and County Council.